Infection control is a major issue in dentistry, mainly, because of the concern over contagious diseases transmitted in health-care settings. The cleaning and sterilization of endodontic instruments between treatment sessions are essential to prevent cross infection. However, the effects of the heating and cooling cycles used during sterilization on the mechanical properties and resistance to fracture of endodontic instruments have not been clearly stated. 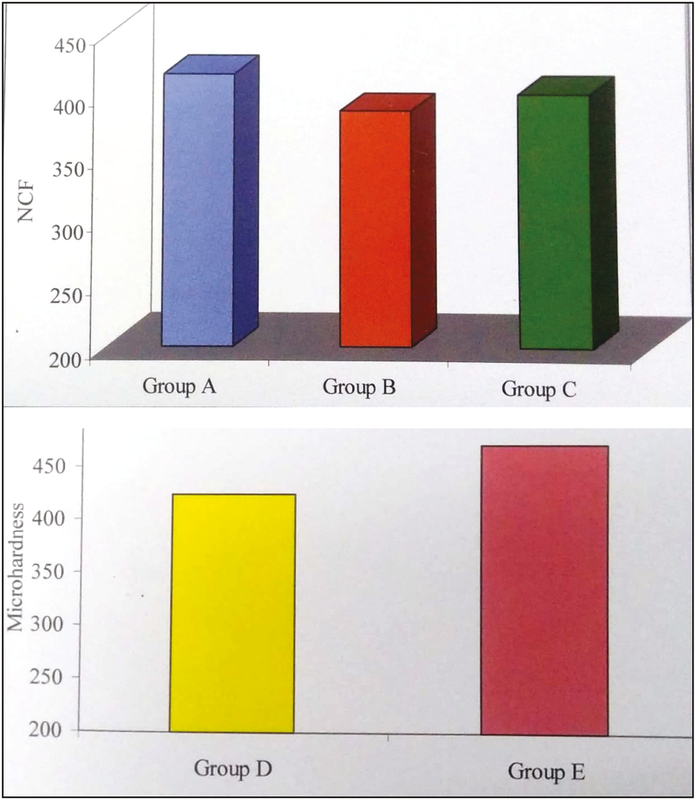 So this study was performed with the objectives of clarifying the effects of sterilization on the mechanical behavior and fatigue resistance of rotary nickel–titanium (NiTi) endodontic instruments. The significance of this study was to get an accurate idea of how many times a NiTi rotary endodontic instrument can be used and sterilized in an autoclave before fatigue fracture occurs. This will greatly help the clinician to limit the number of use of instruments and at the same time, to reduce the cost of the treatment by not discarding it after single use. The objective of this study was to clarify the effects of sterilization on fatigue resistance and Vickers microhardness of rotary NiTi endodontic instruments. Thirty-six fresh ProTaper Files- Dentsply (maillefer) Ballaigues, Switzerland rotary files with size F2 and length 25mm were evaluated for fatigue test and hardness without sterilization and after five cycles of autoclaving. These were grouped into A, B, and C (12 per group). An artificial metallic canal made of chrome–cobalt alloy Figure 1], which simulated a curved root canal allowed the instruments to freely rotate inside it. A “C”-shaped clamp made of cast iron [Figure 2] is used to hold the two halves of the artificial canals together while the instruments are tested inside the canal. X-Smart endomotor (Dentsply, Maillefer, USA). Digital stopwatch to record the time in seconds. Light mineral oil as lubricant. Twenty-four fresh ProTaper NiTi endodontic files of size F2 and length 25mm were selected. They were divided into two equal groups. Clemex (Clemex Technologies Inc. Longueuil, Canada) microhardness tester and computer software program to calculate Vickers microhardness (tested at National Institute for Interdisciplinary Science and Technology, NIIST, Thiruvananthapuram, Kerala, India). Pink [Figure 3] and white [Figure 4] self-cure acrylic powder and liquid (for embedding the files). Airotor straight diamond bur, emery paper no. 200–420 for polishing. 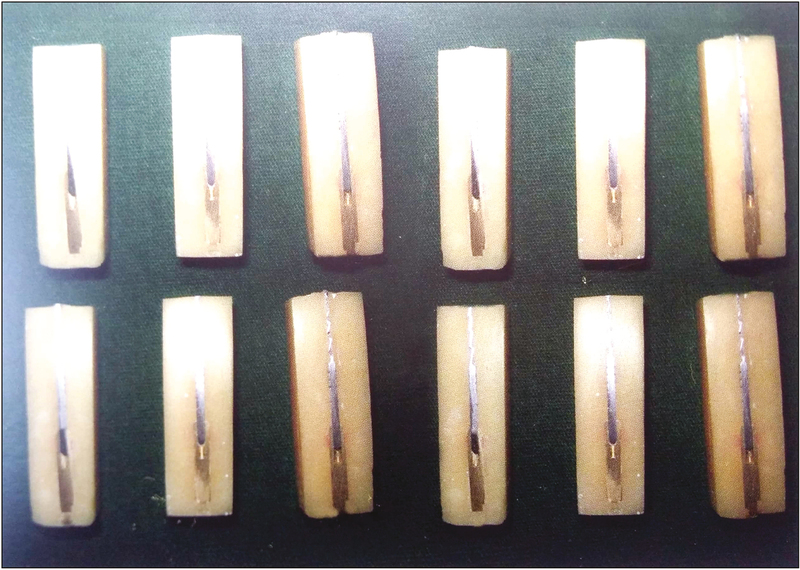 • Thirty-six fresh ProTaper NiTi endodontic files of size F2 and length 25mm were used for fatigue testing. These were grouped into group A, group B, and group C (12 instruments per group). where, 250 is the RPM set in the endomotor. 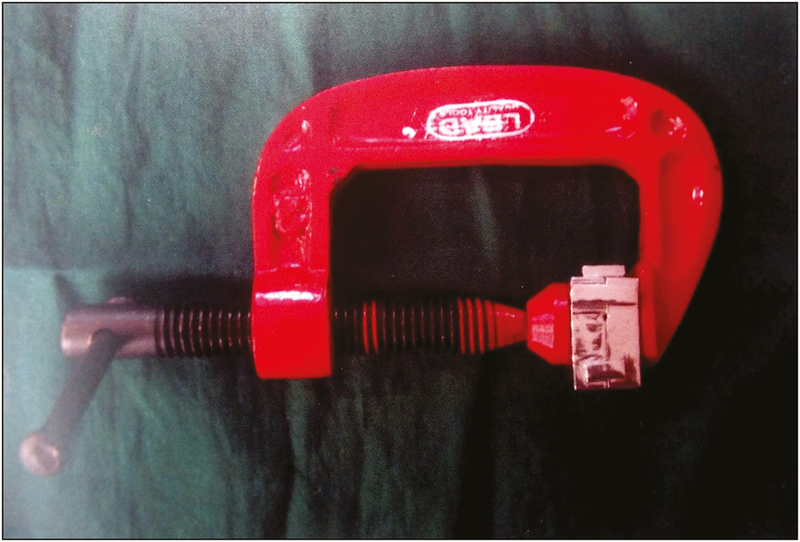 The two parts of the artificial canal device were joined by a “C” clamp to hold them tightly while NiTi instrument is being tested. Once the fracture of instrument occurs, this clamp can be released and the two parts are separated to retrieve the broken instrument. The time taken to rupture is noted using a digital stopwatch and is multiplied with RPM to obtain the NCF. Twelve new ProTaper rotary files with size F2 were taken. These files were then fatigued to half of the average of NCF of the new instruments. As the average time taken to failure in group A, that is, the fresh instruments, was found to be above 90s, it was decided that all the instruments in group B be fatigued for 45s. Then this group was subjected to five cycles of sterilization in an autoclave and later tested until fractured in the fatigue-testing device as described earlier. The time taken to fail was noted and added with 45s to get the total time to fail, and the value of NCF was calculated. This group was tested to get an assessment of the effect of sterilization on used instruments, on their fatigue resistance, and useful clinical life. Twelve new F2 size ProTaper rotary files were taken and submitted to five cycles of autoclaving and then tested till they were fractured in the fatigue-testing device as described earlier and NCF was noted. This group was tested to assess the effect of sterilization alone on the fatigue resistance of the NiTi files. Twelve fresh ProTaper (size F2) rotary files were selected for testing Vickers microhardness test. 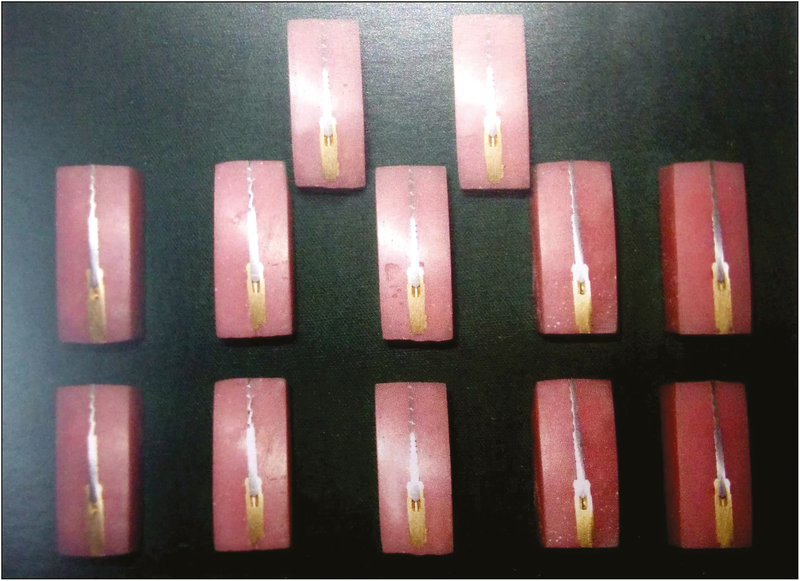 Each of these files were embedded in an acrylic block (white acrylic) [Figure 4] and ground so that unmachined part of the shank was made flat and then polished sequentially to get a polished surface. Vickers microhardness was tested in this polished part of the shank (flat surface) using Clemex microhardness tester and computer software program at the NIIST. The values obtained for unsterilized samples were tabulated. Twelve F2 ProTaper files were taken and were subjected to five cycles of autoclaving and then tested for Vickers microhardness in the same machine (Clemex) and using the same software program. These sterilized groups of files were embedded in pink acrylic block [Figure 5] to distinguish them from the control group (group D), which were embedded in white acrylic blocks. Vickers microhardness values for these 12 instruments were tabulated. The NCF in each group, that is, groups A, B, and C was tabulated and the mean values of each group were calculated. A one-way analysis of variance (ANOVA) test was carried out to check whether these groups differed significantly in statistical analysis. The result obtained was that group A, group B, and group C did not show any statistically significant difference (P > 0.05). Duncan’s multiple range test was also performed to observe whether there were statistically significant differences between group A and B, group B and C, or group A and C. That also ruled out statistically significant difference. However, group A, which were fresh ProTaper instruments, showed a slightly higher value of NCF. In the Vickers microhardness test, results showed an increase in the microhardness of group E instruments, which were the sterilized group. This was a statistically significant difference. Student’s t-test was used to analyze this. These results were in confirmation with the previous studies, which stated that multiple sterilization cycles increased the Vickers microhardness of NiTi rotary files. According to the study by Viana et al., this increase in microhardness was not statistically significant. But in this study, we got an increase in the microhardness of sterilized instruments and this increase was statistically significant. Results: The NCF in each group, that is, groups A, B, and C were tabulated and the mean values of each group were calculated. A one-way ANOVA test was carried out to check whether these groups differed significantly in statistical analysis. The result obtained was that group A, group B, and group C did not show any statistically significant difference (P > 0.05). In the Vickers microhardness test, results showed an increase in the microhardness of group E instruments, which were the sterilized group. This gave a statistically significant difference. Student’s t-test was used to analyze this. This results were in confirmation with previous studies, which stated that multiple sterilization cycles increased Vickers microhardness of NiTi rotary files. According to the study by Viana et al., this increase in microhardness was not statistically significant. But in this study, we got an increase in the microhardness of sterilized instruments and this increase was statistically significant. The use of effective infection control procedures and universal precaution in the dental surgery will prevent cross contamination. Aseptic techniques are especially important in endodontics because microorganisms are the major cause of endodontic disease. Sterilization of endodontic instruments is important for two reasons: the elimination of patient cross contamination and the increase in the success of the endodontic therapy. The American Dental Association, Council on Dental Therapeutics, Council on Dental Practice, has recommended that heat sterilization be used for all instruments that can withstand repeated exposure to the required sterilization temperature. For this study, sterilization in steam autoclave was chosen because it is the most widely accepted method. One of the problems presented by stainless steel endodontic instruments is the corrosion caused by sterilization in conventional steam autoclaves. Thus, dry heat sterilization of these instruments is preferred by many professionals. However, dry heat is not as penetrating as steam autoclave sterilization, and also demands higher temperatures and longer times (Miller, 1996). It is clear that the physical properties of endodontic instruments, such as cutting efficiency, flexibility, and resistance to torsional and fatigue fracture, should not be significantly altered by the sterilization procedures. The choice of five sterilization cycles was based on the literature reports stating that rotary NiTi instruments can be safely used to shape 10 curved root canals (Yared et al. 1999, Gambarini 2001).,,, As only curved root canals induce fatigue in the instruments, five cycles of sterilization correspond to average clinical use during the average useful life of the instrument. Because the main interest was to detect possible cumulative changes in the properties associated with the heating and cooling cycles, they were applied consecutively to the new and the previously fatigued instruments. As pointed out by Thompson, NiTi endodontic instruments are machined from wires containing approximately 56 weight% Ni, which are previously cold drawn and then annealed in the temperature range, which favors partial recovery of dislocation and precipitation of TiNi4. After the machining process, no thermal treatment is applied to the NiTi endodontic instruments. From the metallurgical point of view, the temperature used in sterilization may not be high enough to cause significant changes in the alloy structure. The required changes to increase hardness, cutting efficiency, and fatigue life would be related to precipitation of Ni3Ti4 particles., However, it is possible that consecutive cycles of sterilization give rise to cumulative effects, leading to an increase in hardness in rotary NiTi endodontic instruments after sterilization, as observed by Serene et al. and Melo et al. in NiTi wires and instruments, respectively. However, Hilt et al. did not observe this effect on similar instruments. This study showed a small increase in the hardness of NiTi ProFile instruments after five consecutive sterilization cycles. What can be stated is that even if sterilization does not render rotary NiTi endodontic instruments stronger, it does not result in deleterious effects that could reduce their mechanical resistance. This is an important result in itself, implying that sterilization, in steam autoclaves, does not compromise the mechanical behavior of rotary NiTi endodontic instruments, assuring the possibility of their reuse after sterilization. Fatigue strength is one of the most important aspects to be considered in device applications using rotary parts. The term “fatigue” is appropriate, as it refers to the time-delayed failure of material subjected to cyclical stress and involves three stages: (1) crack nucleation, (2) slow and gradual growth, and (3) fast final fracture. Nucleated cracks grow as a result of a time-varying stress called cyclical stress. The manufacturing of NiTi endodontic instruments is more complex than that of stainless steel instruments, as the files have to be machined rather than twisted. This leads to surface irregularities (milling marks) and metal flash on the cutting edges, which may potentially precipitate crack nucleation.,, Cracks were found to start at surface irregularities, scratches, and inclusion, which act as stress raisers during cycle loading. As noticed by Kuhn et al., when the material is subjected to deformation or stress by machining, a high density of lattice defects, such as dislocations, is produced. Their X-ray diffraction and Vickers microhardness measurements on NiTi instruments showed that the alloy is work-hardened. It is important to mention that some authors used metal guide tubes as artificial canals to simulate root canal geometry in the studies of fatigue.,, Artificial canals prepared in this way may undergo wear and tear during testing and may not sufficiently restrict the instrument shaft, which may tend to regain its original straight shape, aligning itself into a trajectory of greater radius and less deformation. This may explain the higher average NCF values found in similar instruments. Instrument fracture that occurred, on average at 5mm from the tip, without significant statistical difference between sterilized and non-sterilized instruments, indicates that the instruments always failed at the point of maximum tensile strain amplitude of the artificial canal, intentionally located at this point. It was verified early on that the fatigue behavior of NiTi ProFile instruments is characteristic of low-cycle fatigue (NCF <103), where cracks are nucleated early in the process and that their slow propagation occupies the largest fraction of an instrument’s fatigue life. Thus, it is possible that the observed increase in the NCF of the instruments subjected to sterilization is a result of a delay in fatigue crack nucleation and/or propagation, as the result of changes in the surface and subsurface defect structures generated during instrument machining. In fact, it is well known that deformation causes stabilization of martensite. As no thermal treatment is applied to the instruments after machining, it is reasonable to expect that their surface and subsurface regions contain stabilized martensite with a high concentration of dislocations. In the instruments fatigued to one-half of their fatigue life before sterilization, the amount of these defects is still higher. In both cases, the sterilization procedures may have caused dislocations, annihilation, and transformation of stabilized martensite back to austenite. Changes in the mechanical properties of NiTi endodontic instruments after five cycles of autoclaving were insignificant. From the point of view of the clinician, the results obtained in this study suggest that this sterilization procedure is safe as it did not adversely affect the properties of the NiTi files. However, the sterilization procedure did not add to the useful clinical life of the instruments. Careful monitoring of the used instrument with regard to the number of use should be carried out, that is, the used files should be kept separately in an endo-organizer and the number of uses should be noted and limited. The most common reason for failure of the files was flexural strain, which almost always corresponded to the area of maximum curvature of the simulated root canal. As the microhardness was increased in the sterilized group, a slight reduction in the flexibility of the instruments may be anticipated even though it may not be clinically significant. Viana AC, Gonzalez BM, Buono VT, Bahia MG. Influence of sterilization on mechanical properties and fatigue resistance of nickel-titanium rotary endodontic instruments. Int Endod J 2006;39:709-15. ADA Council on Dental Therapeutics, Council on Dental Practice. Infection control recommendations for the dental office and the dental laboratory. J Am Dent Assoc 1988;116:241-8. ADA Council on Dental Therapeutics, Council on Dental Practice. Infection control recommendations for the dental office and the dental laboratory. J Am Dent Assoc 1996;127:672-80. Bahia MGA, Buono VTL. Decrease in the fatigue resistance of nickel-titanium rotary instruments after clinical use in curved root canals. Oral Surg Oral Med Oral Pathol Oral Radiol Endod 2005;100:249-55. Canalda-Sahli C, Brau-Aguadé E, Sentís-Vilalta J. 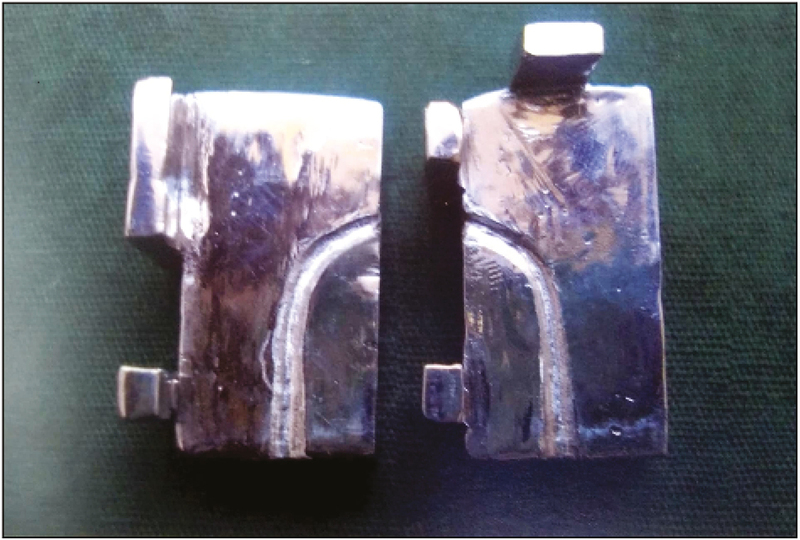 The effect of sterilization on bending and torsional properties of K-files manufactured with different metallic alloys. Int Endod J 1998;31:48-52. Courtney TH. Mechanical Behavior of Materials. 1st ed. New York: McGraw Hill; 1990. Eggler G, Hornbogen E, Yaeny A, Heckmann A, Wagner M. Structural and functional fatigue of NiTi shaper memory alloys. Mater Sci Eng 2004;378:24-33. Gambarini G. Cyclic fatigue of ProFile rotary instruments after prolonged clinical use. Int Endod J 2001;34:386-9. Hilt BR, Cunningham CJ, Shen C, Richards N. Torsional properties of stainless-steel and nickel-titanium files after multiple autoclave sterilizations. J Endod 2000;26:76-80. Hurtt CA, Rossman LE. The sterilization of endodontic hand files. J Endod 1996;22:321-2. Khalil-Allafi J, Eggler G, Dlouhy A, Schmahl WW, Somsen C. On the influence of heterogeneous precipitation on martensitic transformations in a NiTi shape memory alloy. Mater Sci Eng 2004;378:148-51. Kuhn G, Tavernier B, Jordan L. Influence of structure on nickel-titanium endodontic instruments failure. J Endod 2001;27:516-20. Martins RC, Bahia MGA, Buono VTL. Surface analysis of ProFile instruments by scanning electron microscopy and X-ray energy-dispersive spectroscopy: A preliminary study. Int Endod J 2002;35:848-53. Melo MCC, Bahia MGA, Buono VTL. Fatigue resistance of engine-driven rotary Ni-Ti endodontic instruments. Int Endod J 2002;28:765-9. Miller CH. Infection control. Dental Clinics of North America 1996;40:437-56. Otsuka K, Ren X. Physical metallurgy of Ti-Ni based shape memory alloys. Prog Mater Sci 2005;50:511-78. Reams GJ, Baumgartner JC, Kulild JC. Practical application of infection control in endodontics. J Endod 1995;21:281-4. Serene TP, Adams JD, Saxena A. Ni-Ti Instruments: Applications in Endodontics. St. Louis, MO: Ishiyaku EuroAmerica; 1995. Thompson SA. An overview of nickel-titanium alloys used in dentistry. Int Endod J 2000;33:296-310. Yared GM, Bou Dagher FE, Machtou P. Influence of rotational speed, torque and operator’s proficiency on profile failures. Int Endod J 2001;34:47-51. Yared GM, Bou Dagher FE, Machtou P. Influence of rotational speed, torque and operator’s proficiency on ProFile failures. Int Endod J 1999;34:115-9. Yared GM, Bou Dagher FE, Machtou P. Cyclic fatigue of ProFile rotary instruments after clinical use. Int Endod J 2000;33:204-7.